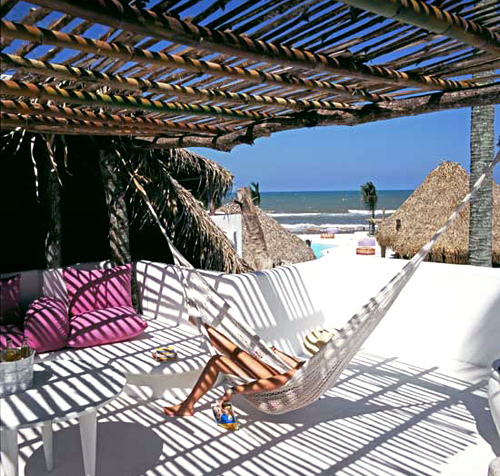 okay, i think i just might move into one of the 20 bungalows at hotel azúcar in veracruz, mexico after seeing a few pictures in elle decor and travel & leisure. their website is fantastic, too - reflecting the design of the hotel, which is vibrant and playful, with a modern, clean edge. the design of the hotel is inspired by celia cruz, latin music legend, and is full of unique touches, like a thatched-roof outdoor library, filled with white adobe benches and hot hot pink pillows. 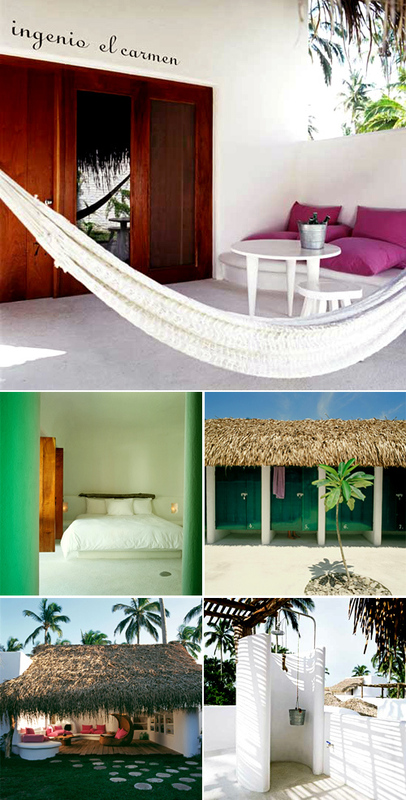 each room has a private terrace and hammock... perfect! rates right now are 1600 pesos for a double bedroom, which currently works out to about $150 a night. to get to the small town, you can drive a bumpy road or fly (in a tiny 4 seater) from mexico city. sign me up! ps - azúcar is owned by the same crew that created the fabulous condesa DF in mexico city, the vibrant hotel básico on the mayan riviera, and the minimalist hotel habita, also in mexico city. they are all well-designed, but i am most drawn to the lively, casual-luxe style of the azúcar and the básico. go ahead and make those reservations... I'll start packing the bags.